Translating Gutenberg blocks is really straight forward by using TranslatePress. 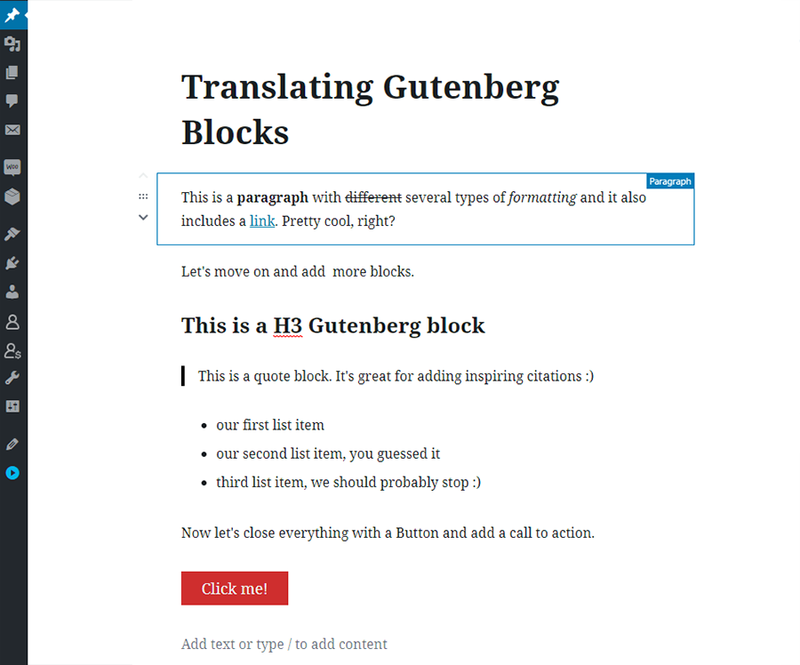 In this tutorial we’ll focus on how to translate Gutenberg blocks of any type, including headings, paragraphs with different formatting, quotes, lists, buttons and more. Gutenberg is the new editor for WordPress, which is part of the core since WordPress 5.0, and has a strong impact on the whole publishing experience. It makes it easy for anyone to create rich, flexible content layouts. Gutenberg blocks are a great tool for building and styling different types of content, without having to write a single line of code. If you’re looking to make your site available in multiple languages, you need a simple way to translate the content from each Gutenberg block. To enable Gutenberg simply install and activate this free plugin. Now let’s add a new post that contains some of the most popular Gutenberg blocks. As you noticed I added a paragraph with formatting, multiple headings, a quote block, a list and a button. All that’s left is to download and install TranslatePress and translate each one of them. For this example we’ll add French as a secondary language. 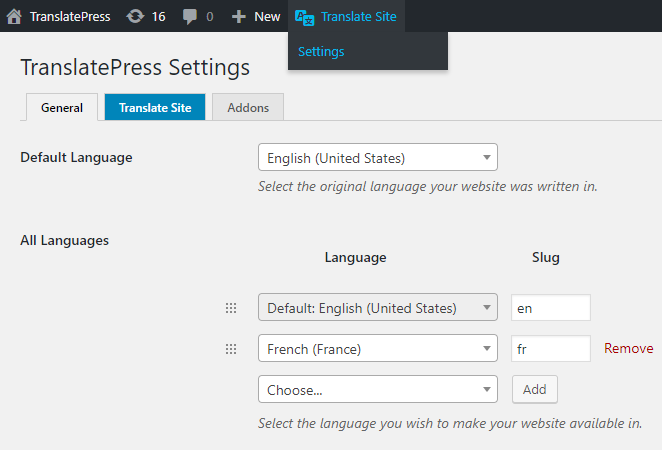 After activating the plugin, navigate to TranslatePress Settings page and add French as a secondary language. Save the settings and simply click the Translate Site button to start translating your content. This will open a front-end translation interface, in which you can navigate the site and click on certain content in order translate it. From the language drop-down on the left, make sure to select “French” so we can get a real time view when translating a certain string. Similar to Gutenberg, the translation process in TranslatePress is also focused on blocks of content in a visual and intuitive interface. Let’s start with translating the post title, which is a h2 heading. In the translation interface simply hover over the title and you’ll notice an edit icon appearing. Clicking it will allow to add/edit a new translation. Click the “Save translation” button and you’ll see the “French” post title already updating. Next, we’ll move to translating the first paragraph. Because of the formatting it includes multiple html elements, so TranslatePress will break it into smaller pieces. In order to translate the entire paragraph at once you can simply click the Merge icon to create a single block out of the whole sentence. If you later decide to undo this merging operation in order to translate the small strings individually, you can just click the split button . The translation of the entire block will be available any time by merging it back. 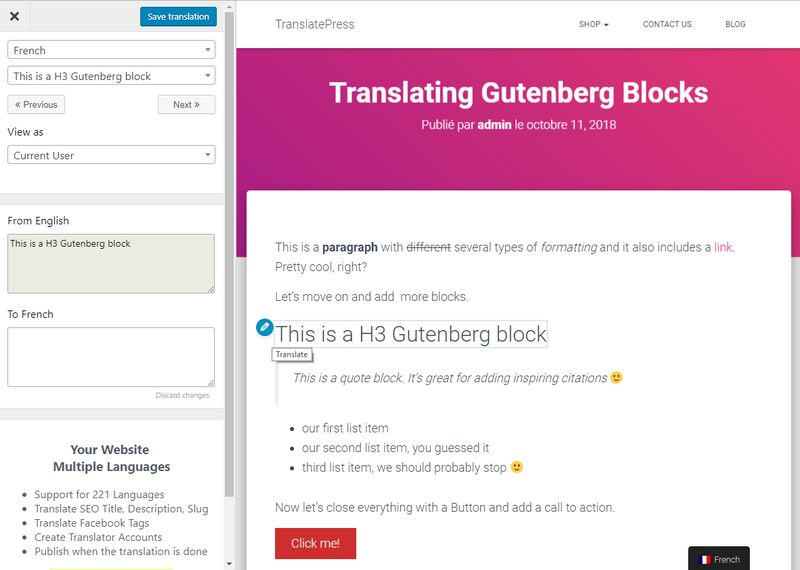 A Gutenberg list block is translated the same way, by simply hovering, selecting each list item and entering the translation for each one. Finally, we’ll translate the call to action button added to our rich text post. That’s right, just hover, click the icon for adding the translation, then save it. That’s it, our post created using multiple types of Gutenberg blocks is now fully translated into French. This sums up how simple it is to translate Gutenberg Blocks using TranslatePress. Play with the demo and see for yourself.